The Prison Chapel was a Church of England chapel within the Portland Convict Establishment. Built and opened in 1849, it formed one of the principal buildings of the original prison and served convicts at Portland until 1921, when the establishment was transformed into a Borstal Institution. The chapel was then converted into a hall and workshops. It was destroyed in a German air raid of 1941 and the site is now occupied by the prison's administration block. A temporary convict establishment for Portland was announced by the government in 1846 and its construction carried out in 1848, with the first convicts arriving that November. As a public works prison, those incarcerated at Portland would provide labour in the Admiralty Quarries, producing stone for various government works on and off the island, namely the two breakwaters arms being constructed to transform Portland Roads into a harbour of refuge. Although a purpose-built Church of England chapel had been included in the original prison plans of 1847, no such building was constructed and as a temporary measure the prison chaplain and his assistant, Rev. Henry Moran and Rev. Reginald Blathwayte respectively, held services for groups of convicts in their own wards or other areas of the prison. Construction of a chapel at Portland was approved in 1849 and the foundation stone laid on the morning of 25 July 1849 by Lieutenant-Colonel Joshua Jebb, the C.B. Surveyor-General of Prisons, who had designed Portland's prison. The entire convict population, along with warders and staff, spectated and took part in the ceremony, which included the singing of a hymn. Rev. Joseph Kingsmill of Pentonville Prison officiated the ceremony in place of Rev. Moran, who was absent due to ill health, and read a prayer written by the chaplain, part of which read: "On this special occasion we desire to praise Thee that the means of grace are provided in this place, and that this house of prayer is being erected for Thy name and service. May the stone laid this day remind us of the chief cornerstone, and lead us to look for grace to rest upon Him as our only foundation." In his speech, Jebb told the convicts: "[I] chiefly expect success from the moral and religious instruction to be communicated in that sacred edifice about to be erected." On the same day as the laying of the chapel's foundation stone, HRH Prince Albert visited Portland to lay the foundation stone of the breakwater works. Following this ceremony, the prince inspected the prison and presented a "handsome" bible and prayer-book for future use in the chapel. The prince signed the insides: "Presented to the chapel of the convicts at Portland as a token of interest, and in hope of their amendment." The books were received by Rev. Kingsmill, who gave another address before the prince and spectating convicts. The chapel was completed by the end of the year and opened for divine service on 25 December 1849. Originally able to accommodate up to 1,000, it was soon enlarged in 1854-55, as general expansion of the prison increased capacity from 800 to 1,500 convicts by 1853. The general numbers attending Sunday services at the chapel in 1855 was approximately 1,700, 1,400 of which were convicts. In his chaplain's report for that year, Rev. W. Holderness commented: "Strangers are surprised at the orderly deportment and devout attention of these unfortunate men, who as a body reverence the externals of religion, and appear to be interested in its sublime truths. We believe there is no congregation of free persons in the United Kingdom, who conduct themselves with greater propriety." Although a disturbance was considered unlikely, strict measures were put in place to ensure harmonious and violence-free services. The ground floor seating was separated into compartments by wooden dividers, enabling the convicts to be placed and managed in smaller groups. Warders were provided with raised chairs, allowing them to supervise the prisoners, while an armed guard was also made present at each service and placed at the back of the chapel behind a protective iron railing. Many residents of the Grove, largely prison warders and their families, also used the prison chapel for worship and they were often accommodated in the galleries. Residents were able to continue attending services there until the completion of the village's own St Peter's Church in 1872 and the final service open to residents in the prison chapel was held on 25 August of that year. 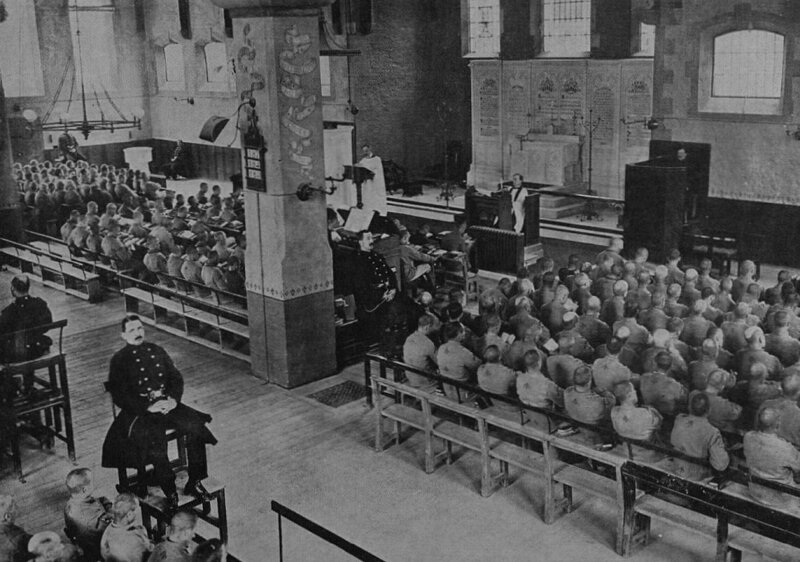 In addition to its use for services and bible classes, the chapel also hosted the prison school from at least 1860, which the The Leisure Hour described during the following year as "an arrangement open to very serious question". The school was later relocated to the prison halls in 1876 and the chaplain expressed approval of the move in his annual report: "Men could hardly be induced to maintain an appearance of reverence in a place which for a few hours during the week was used for divine worship and for the rest of the time was the scene of all the bustle attendant upon the instruction in reading, writing, and arithmetic, of large classes of adults, of letter writing, and distributing library books, and other work of a purely secular character. I can [now] testify that classes are conducted in a more orderly manner than they were in the chapel." The chapel underwent some minor alteration and improvement work in 1900, which included the removal of divisions and rearrangement of seating, as well as the installation of piping, radiators and a boiler in the apparatus room. The Bishop of Salisbury, John Wordsworth, expressed approval at the "improved appearance" of the chapel during an annual confirmation held there in March 1901. 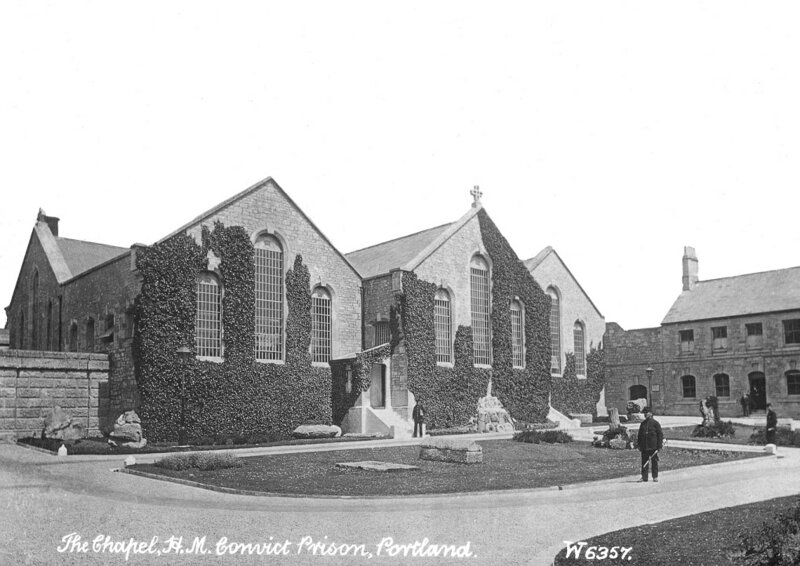 In 1921, the convict establishment became HM Borstal Institution Portland and the last of the convicts were relocated to other prisons that September. Over the following decade, much conversion work took place, which included the original cell blocks being transformed into "houses" as part of the effort to turn the Borstal into "an educational and training establishment" and to "eliminate all associations of its forbidding past". 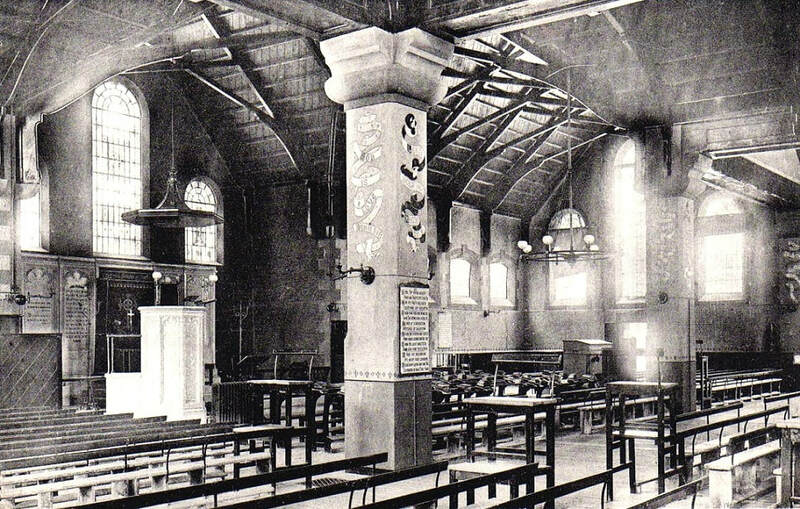 Plans were drawn up in 1922 to have the chapel transformed into a hall with classrooms, as well as a dining area for special grade boys, with Church of England services to be moved into the existing special grade dining hall. 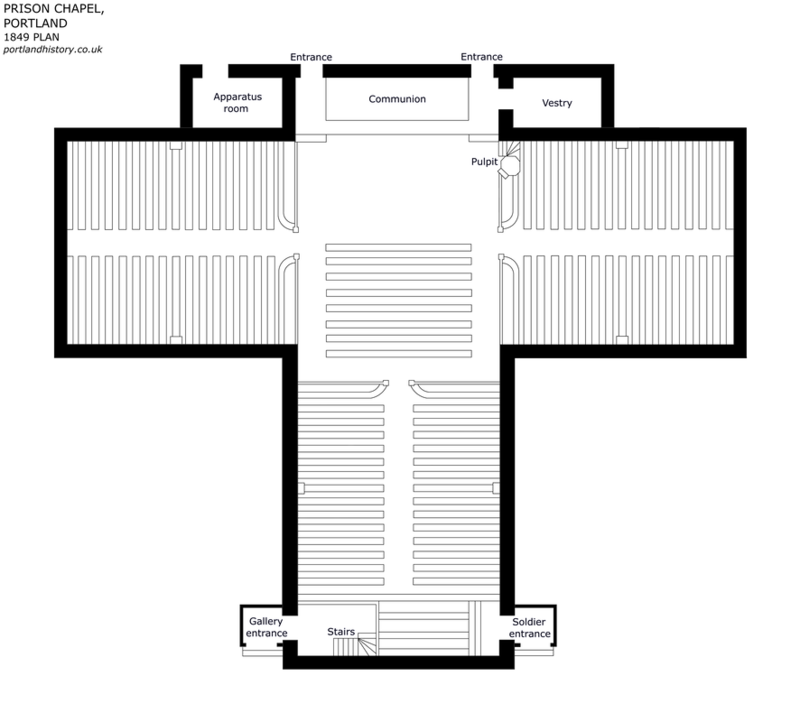 The earliest conversion work was carried out that year when screens were added to one section of the chapel to form the classrooms, leaving the rest of the building to continue use as a chapel, pending its conversion into the proposed hall and dining area. Later that same year, the Borstal governor suggested the potential use of the Borstal's Roman Catholic chapel for Church of England services, allowing the special grade dining hall to remain in its existing location. The chapel's remaining space was then transformed into a large hall for use as a combined gymnasium, concert hall and venue. The conversion work was undertaken by the Borstal boys themselves, which included the removal of most of the chapel's galleries and the construction of a stage. As proposed, Church of England services were transferred to the nearby Roman Catholic chapel. One of the earliest uses of the stage was in 1926 when the five-act revue "A Trip to Florida", written by Borstal officer Mr T. Badger, was performed to hundreds of local residents. For the performance, the remaining gallery space was reserved for the Borstal governor and warders. The Birmingham Daily Gazette reported of a play: "The old convict chapel was transformed into a theatre, with stage complete with scenery and footlights. Borstal officers and lads entertained with songs, grave and gay, and romantic and humorous interludes. The officers' orchestra played musical accompaniments." During the mid-to-late 1920s, some of the Borstal's cell blocks were converted to contain their own classrooms, which in turn prompted the removal of those in the former chapel. The final layout of the chapel was completed by 1931, with the hall retained and the classroom area transformed into two sections, housing a tailor shop and shoe repair shop. During World War II, Portland and its naval base became a primary target for the Luftwaffe, who carried out 48 attacks there over the course of the war. One such raid on the night of 15 April 1941 saw the destruction and damage of a number of buildings within the Borstal's walls and resulted in the former chapel being burnt out by incendiary bombs. Its ruins were soon cleared and by 1950 the site accommodated four temporary huts used as classrooms. The two workshops which had been housed in the former chapel were relocated and a temporary gymnasium established in a new building alongside the Roman Catholic chapel, pending the construction of a permanent one in the early 1960s. A new administration block for the Borstal was later constructed on the site of the former Church of England chapel in the early 1970s. After the chapel ceased religious use in the 1920s, Church of England services continued to be held at the Roman Catholic chapel into the 1970s. When St Peter's was declared redundant in 1973, it began use as a private chapel for the Borstal until 1988. Today the religious facilities at HM Prison Portland consist of a large multi-faith space and smaller rooms used for small groups and one-to-one sessions. The chapel, built of Portland stone, was originally a T-shaped building, measuring 112 feet long from east to west, and 90 feet from north to south. The ground floor seating was divided into eight sections in its original layout. The two main entrances were located on the chapel's northern side, while the south had two entrances with porches, one providing access to the armed guard seating area and the other to stairs leading up to gallery level. The northern region of the chapel also incorporated a small apparatus room and vestry. The extension work of the 1850s gave the chapel more of a square-shaped plan, while other minor alterations were made over the course of the building's use, including the replacement of the northern entrances with one each on the west and east sides. In 1859, Weekly Record described the chapel as a "handsome building" and The Morning Post described it as a "spacious edifice" in 1865. The Western Daily Press described it as a "commodious edifice, of unpretentious but chaste appearance" in 1868. A postcard showing the chapel in the 1900s, taken by Wyndham & Co of Acton as part of their "Wyndham Series". Another "Wyndham Series" postcard from the 1900s, showing the interior of the chapel. A service being conducted in the chapel. This photograph supplied by "Giles" was published in a September 1910 issue of the Illustrated London News. A plan showing the original layout of Portland Prison's chapel, based on a drawing included in the 1850 "Report on the discipline and construction of Portland Prison" by Lieutenant-Colonel Jebb. It can be enlarged by clicking on it.